It Wasn't Me - Honestly! We adopted a 3-year old female cocker spaniel from the cocker rescue in Austin, Texas. The original owners returned the dog as an owner surrender because of an inability to potty train the dog for about 1 year. Foster parents did not comment on this area. 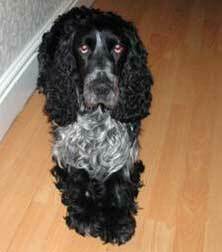 The cocker is not abused and has a wonderful temperament. We have had her for about three weeks and her indoor habits vary with no definite regularity for both pee and poo. She has been checked by our vet and passed the exam. She is an indoor dog and enjoys our walks three times a day. What things have worked for you to begin to manage the problem? I'm sorry to hear about your little problem with your rescue dog but I'm confident that you'll have it remedied very soon. You've had her checked out by the vet so you know she's otherwise healthy! One thing that may be causing your cocker's irregular toilet breaks could be the upset and 'trauma' of moving into her new home and having a new family. This will obviously settle down once she becomes more familiar with her new environment and her new family. Her problems may also be caused by a change in diet, if there's been one. I think it's probably early days yet, but I believe that once she settles down to a regular feeding program, twice each day, and regular walks to stimulate her bowels, her toilet patterns will develop and get back to normal. In the meanwhile, let's get started with the potty training. I'm not sure whether she's ever been fully house-trained, but I would recommend you begin all over again. The trick is to see the signs that she's about to poop or pee and stop her in her tracks by giving her the 'No' command, in a firm voice. Don't shout as that could frighten her. The firm command will probably have the effect of startling her into stopping in mid-stream. Take her outside immediately to the area you have designated for her toilet and allow her to continue. When she's finished, praise her profusely and offer her a treat. She will learn that one type of behaviour gets your disapproval and another gets lots of praise and even a treat! I am assuming that you are using a pet urine cleaner to clean up after her. If you're not, although it will look and smell clean to us humans, your Cocker will be able to smell where she's been which may encourage her to go there again - it's a never ending cycle unless you can remove all smells. You can buy this type of cleaner at most pet stores - your vet may also sell it over the counter. However, until she's fully house-trained, it's important for you to be around to catch her in the act so that she understands what you want from her. If you scold her after she's done the deed, she won't link the two together so she won't understand what she's done wrong. If you haven't already, did you know that crate training your dog can help with toilet training? You can read about the benefits of crate training in this article imaginatively entitled, "Benefits of Crate Training A Puppy! If you need a refresher on potty training your puppy simply follow the link and it will take you through all the steps to get your dog fully house trained. I sincerely wish you best of luck and hope you have lots of happy times with your new Cocker Spaniel! Take her outside every hour on the hour and coax her to do her business - that should work. When she pees or poops tell her she's the best dog in the world. Show her how pleased you are with her. Don't scold her for peeing or pooping in the house because this won't work. It won't stop her. I have used a dog smell removal spray in the past when I've cleaned up in the house (after my dog) and I recommend you do the same otherwise she's going be encouraged to go in that same spot again when she smells her pee. Even though you think it's clean, your dog will still be able to smell it unless you use a special cleaning product.